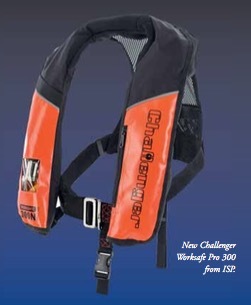 ISP (International Safety Products), whose global portfolio of marine safety products and services cover commercial, leisure and military markets, has added a new lifejacket to its workplace range, the Challenger Worksafe Pro 300. Available as a single chamber 275N, the Challenger Worksafe Pro, which supports 330 Newtons, is designed especially for the tough demands of industrial and commercial maritime environments. An ergonomically designed slim fit for easy donning and a comfortable fit, the Worksafe Pro is constructed of a highly durable but flexible PVC with orange wipe-clean cover. A neoprene anti-abrasion neck further adds to its comfort. The Challenger Worksafe Pro is a bespoke product, and can be customized for commercial and other organizations. A 150N model is also available.